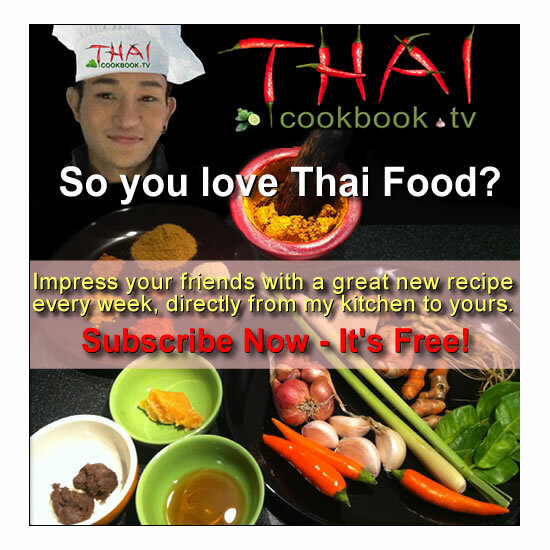 If you like the authentic taste of real Thai food, and like to eat juicy and flavorful pork spare ribs, then you'll love my recipe for oven broiled ribs made with traditional Thai herbs and spices. 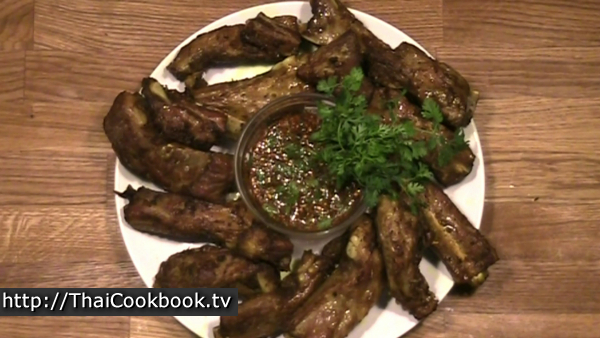 I start by boiling the ribs in a rich and aromatic broth made with lemongrass, kaffir lime leaf, and galangal root to infuse them with a taste of Thailand, then marinate them in a delicious sauce made with garlic, coriander root, black pepper, and soy sauces, before broiling them in a hot oven. The result is a plate of ribs unlike any other. Try it, you'll love it! What's in our Broiled Pork Spare Ribs. How we make our Broiled Pork Spare Ribs. 1) Boil the ribs for 30 minutes in an herbal broth made with kaffir lime, galangal, and lemongrass. 2) Marinate the boiled ribs for 15 - 20 in a sauce made with lemongrass, coriander root, garlic, black pepper, soy sauces, fish sauce, and turmeric powder. 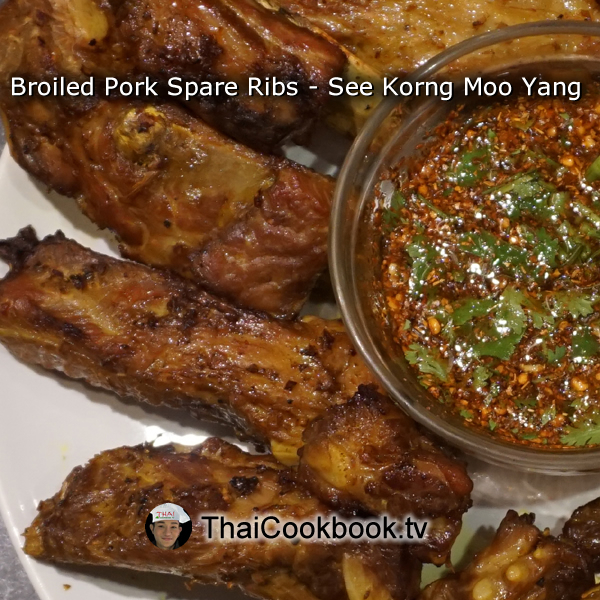 3) Broil the marinated ribs for about 30 minutes in a hot oven, then serve with a dipping sauce made with ground dry chilies and other herbs and spices. 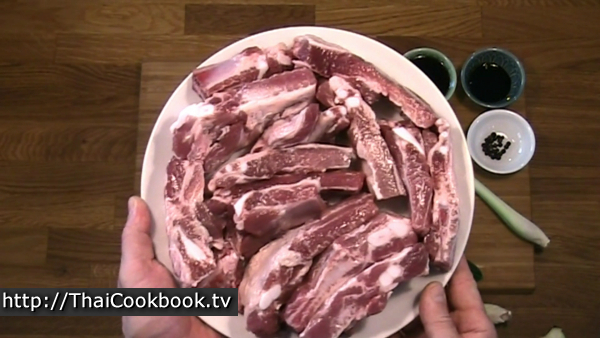 For this recipe, select 12 - 14 big, fatty pork ribs, cut into individual ribs. Start by preparing the herbs for the broth. 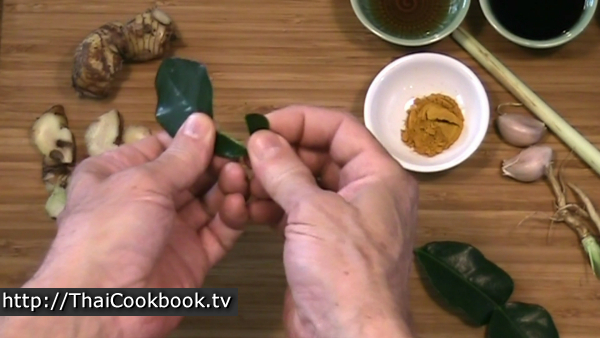 Tear the center stems from 3 - 4 kaffir lime leaves, then tear each leaf into several smaller pieces. Cut the lemon grass into 3 - 4 pieces, then hit them lightly with a mallet or knife handle to break them open just a little. Slice 3 - 4 thin pieces from a piece of galangal rhizome. Bowl about 2 liters of water in a nice big soup pot with a lid. 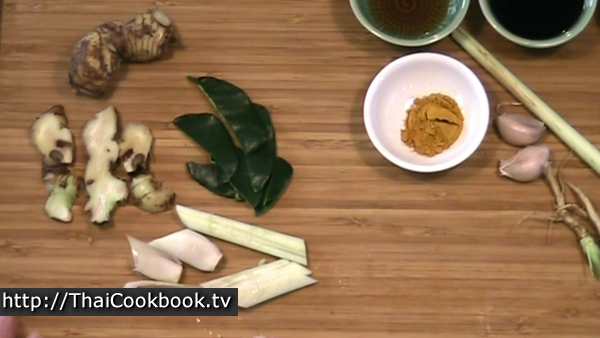 Add the kaffir, lemongrass, and galangal. Boil the herbs for about 5 minutes, or until you have a nice aromatic broth. Add the pork ribs to the pot and bring back to a hard boil. Reduce the heat until the water is barely bubbling, then cover with a lid and simmer like that for about 30 - 45 minutes, or until the meat is done and softened. Note that you do not want to cook the ribs until the meat is falling off, so check them often and remove from the hot water promptly. While the ribs are boiling, prepare the marinade. Cut the coriander roots into small pieces, and slice the bottom portion of the lemongrass stalk very thin. 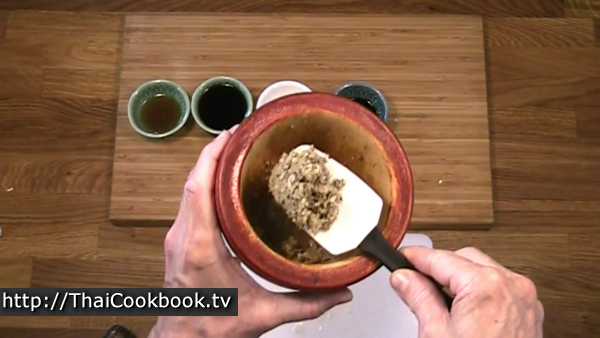 Use a mortar and pestle to grind the coriander root, lemongrass, garlic, and black peppercorns into a rough paste. 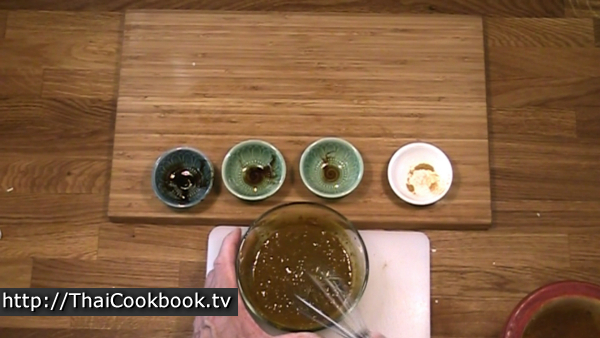 Stir the herbs together with the soy sauces, fish sauce, and turmeric until well blended. Let it sit out until you are ready to marinate the ribs. Remove the ribs from the hot water when they are well cooked, but not so done that the meat is falling from the bone. Allow them to cool down completely on a wire rack so that all the water drains away. They should be mostly dry. Heat your broiler oven to 200° C or about 400° F. Add the marinade, ribs, and about 1 cup of the broth from the soup pot to a large zip-lock bag. Seal the bag and shake it up well to mix everything together. Lay the bag of ribs flat on a table so they are soaking in the marinade, and turn the bag several times in the next 20 minutes while your oven gets hot. 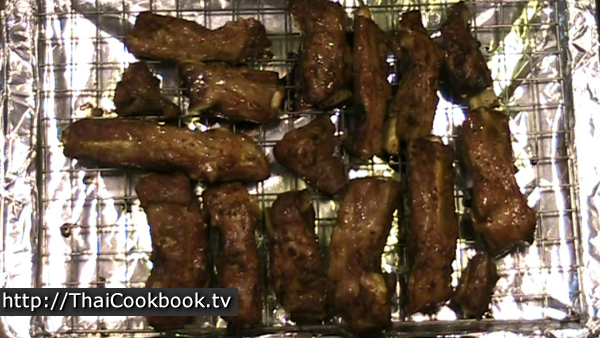 After marinating the ribs for about 20 minutes, place them on a baking sheet with a wire rack. Broil in your oven for about 30 minutes, checking them often so they don't burn. The amount of time will vary depending on your oven, but the goal is to brown them very well and not burn them. 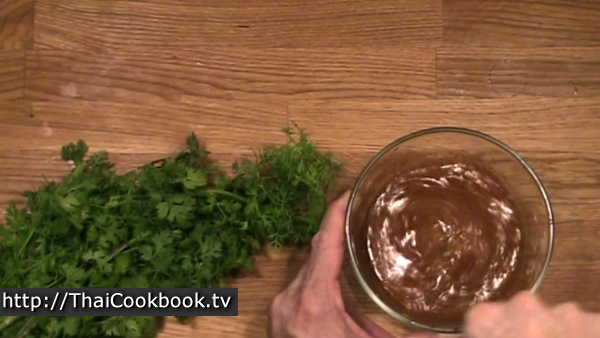 While the ribs are broiling, make the dipping sauce. These ribs will have a lot of flavor, but they are not spicy-hot. Some people like to have this kind of sauce to add hot chili to the flavor. Stir together the fish sauce, lime juice, sugar, toasted ground rice, and ground dried chili until well blended. Allow it to sit and absorb all the flavors together and soften the dry ingredients. 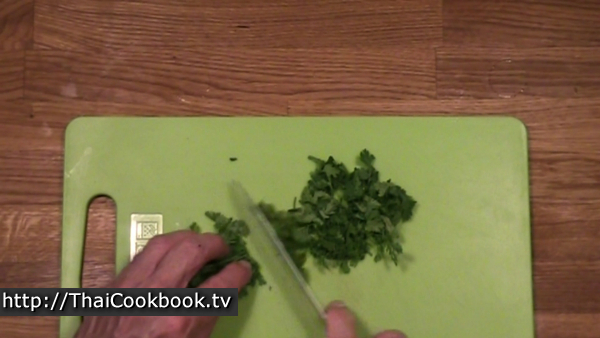 Shortly before you will serve, gently cut the cilantro leaves across into 1/2 inch slices. 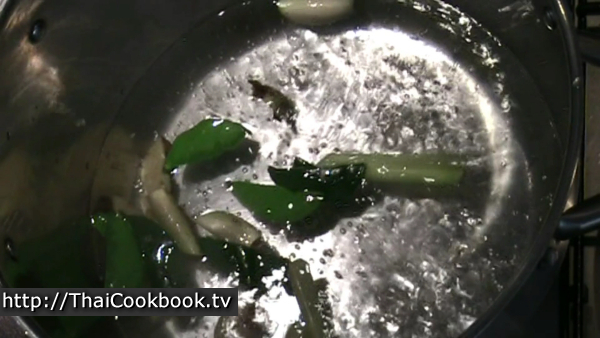 Do not chop it, as this bruises the leaves and lessens the impact of the fresh herb flavor in the sauce. Remove the ribs when it's time. They should be well browned like these are. Allow them to cool for about 15 minutes before serving. 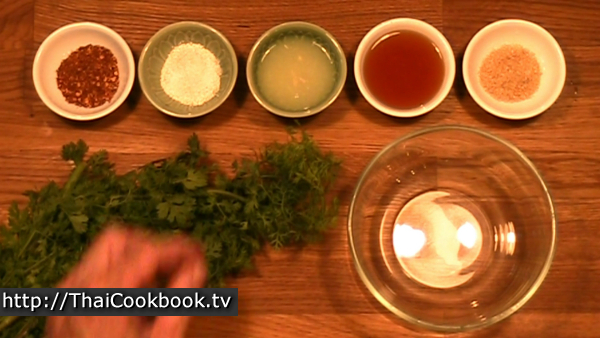 When ready to serve, lightly stir the cilantro leaves into the dipping sauce. Serve the ribs from a big plate with the sauce. Garnish with a few sprigs of cilantro for a colorful impact. 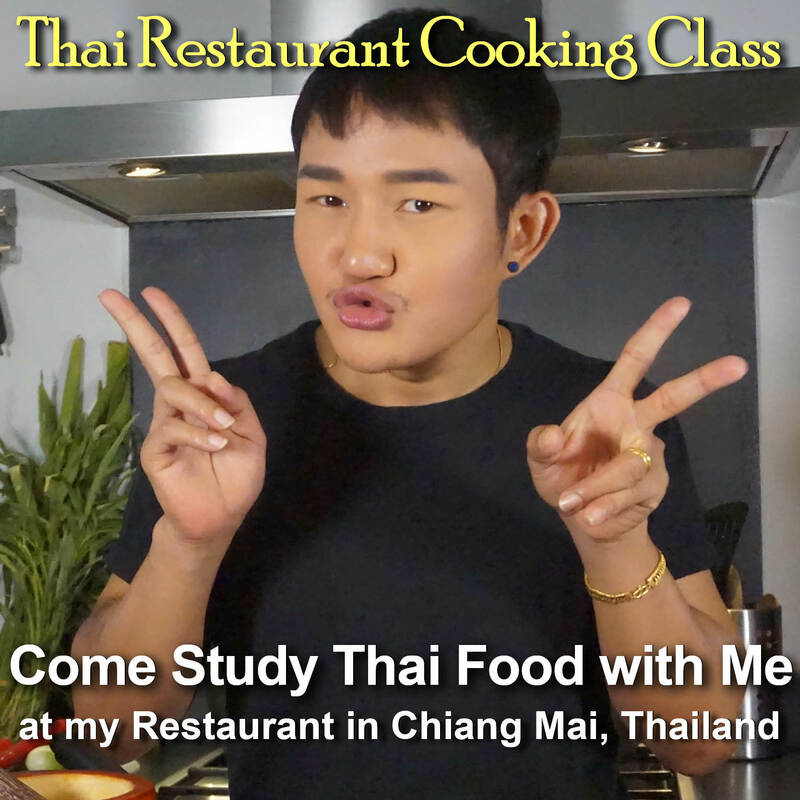 Can be served with sticky rice for a traditional style lunch, or with other foods for a family style meal.